Actually, I didn’t know the Magic Bullet was on TV when I developed an interest. Had I known there was a whole infomercial about this product, I don’t know that I would’ve given it a second glance. I’m still gun shy from the too-good-to-be-true food processor deal I ordered in the 80s. It chopped, diced, shredded, and sliced so well you could ‘toss out all other cutting tools.’ All for the low-low price of only $19.99! I ordered one for my sister-in-law for her birthday. It didn’t arrive in time, so I gave her a card with an I.O.U. for a food processor inside. When it finally arrived, the incredible ‘food processor’ turned out to be a large metal spatula with several different cutting grooves. Kind of like a flat cheese grater. If my sister-in-law and my brother hadn’t split up in the 90s, I’d probably still be hearing about how I owe her a food processor! 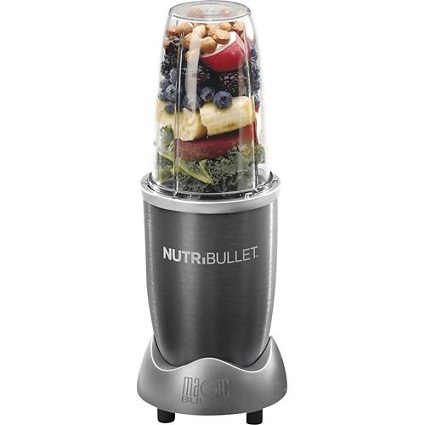 But the Magic Bullet – officially named Nutri-Bullet – is the real deal. 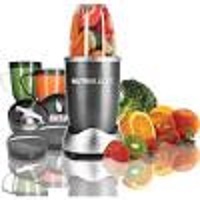 Not just a blender – it’s “a Nutrition Extractor.” I was drawn to the ad in the paper when I saw the words “it busts right through seeds and fruit skins.” Wow – pretty powerful! For the past couple of years, in an effort to get five servings of fruits and vegetables incorporated into my diet, I begin most mornings by making smoothies for me and my husband. 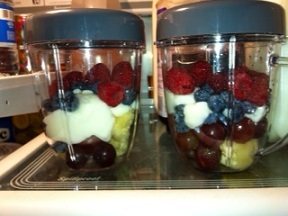 A banana, whatever berries and other seasonal fruit I have, a fat-free yogurt and skim milk. Often I found myself chewing on a grape skin or pulling a blackberry seed out of a tooth long after the smoothie was gone. So the Magic Bullet was a dream product for me. In addition to the power base, it comes with a large cup, 2 smaller cups, 2 cup lids, an extracting (regular) blade, a milling blade (for seeds), a cup holder, and a book full of health tips and recipes. It’s easy to use and blends in seconds, easily cutting through seeds, ice, and frozen fruit. I formerly used a regular blender, would divide the smoothie into two glasses, wrap each with cellophane and put in the refrigerator. I took mine on the drive to work and my husband had his when he got home from work. Now I apportion the ingredients between the two smaller cups, put the lids on, and we can each mix them in a few seconds when we are ready for them – they are definitely better when freshly mixed. At around $100, the Bullet was a bit of a splurge. The creator of the Nutri Bullet intended it to be used for healthy drinks that contain greens. The recipes have names with words like “Elixir” and “Tonic” in them. Not only do they not contain yogurt or any other created food, the book actually says: “Fight any temptation you have to use any processed food like fruit juice.” While I haven’t graduated to adding in greens – which I will likely try at some future date – the Magic Bullet is perfect for my current needs of blasting through the seeds and fruit skins that mar the perfection of my daily smoothies. Do you have a favorite go-to gadget?